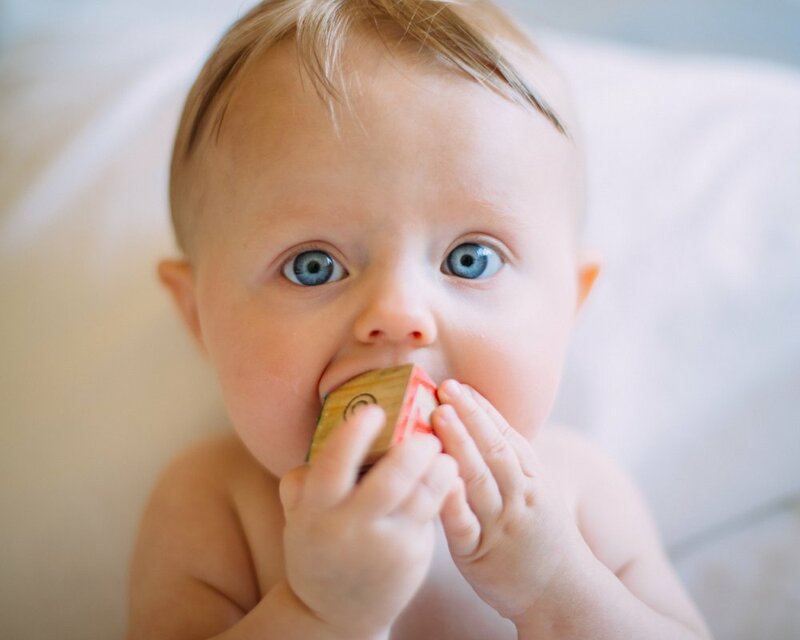 If you’ve been looking into how to introduce your baby to solid foods, you’ve likely found a lot of conflicting information out there – from Google searching, to the advice from family and other parents. A leading child-feeding expert in Canada, even my own advice has changed over the last 10 years as scientific research has learned new information about preventing food allergies. One of the first questions you’re likely wondering about is: “Is my baby ready for solids”. Here’s how to know if your baby is read for baby food. Babies are ready for solid food at about 6 months old. The recommendation for this age comes from two places: changing nutrition needs & developmental stage. First let’s cover the changing nutrition needs. Introducing solid foods is a story about iron. Iron is needed by babies for overall growth and development. It’s also crucial for brain development. Breastmilk is naturally low in iron. So, babies stock pile iron in their bodies before they are born. That’s why your health professionals are so concerned about your iron when you’re pregnant – because both you and your baby need enough iron. At about 6 months, a baby’s iron stockpile starts to run low. It’s time to introduce iron from a new source – i.e. solid foods. Longer Eye Focal Length: Newborns have a very short focal length. Meaning that they will be cross-eyed and unable to focus on anything that’s any length away. We want babies to be active participants in eating solid foods. So, they need to be able to see the spoon coming towards them/ able to see the finger foods on their highchair tray. Extrusion Reflex Disappears: Young infants have a reflex where anything that is placed on the front of the tongue will trigger a reflex to spit out the object. So of course, there is no purpose to trying to feed a baby solid foods if they still have the gag reflex. Hold Head Up: Young infants’ necks can’t support their own heads. We need to see a strong neck that can hold up a head when baby is sitting up so that we can get a straight, clear, safe swallow before offering your baby solid foods. Fixated on Other’s Eating: While this isn’t a true sign of readiness, it is quite common. Many babies will become obsessed with watching people eat and drink, even reaching for your food and glass. Some premature babies will see all the signs of readiness at about 6 months old. Other premature babies will be ready at an age-adjusted timeline. Talk with your health professional to find out if your premature baby is ready to start solid foods. It’s also worth a conversation with your health professional regarding iron. It’s during the last trimester when babies do most of their iron stockpiling. Depending on how premature your baby was, they may need supplemental iron drops. There can be negative effects from iron being too high, so do talk with your health professional before giving your baby iron drops. Check out this post for the best first foods.